Uganda will be without key strikers Geoffrey Massa and Brian Umony when they face African champions Zambia in their 2013 Africa Cup of Nations final-round qualifier on 8 September. The injured pair were not included in coach Bobby Williamson's squad for the first game of the two-legged knockout tie at the Levy Mwanawasa Stadium in Ndola in Zambia. Scotland-born coach Williamson said: "We start serious training on Friday and expect all foreign-based players to arrive by Tuesday next week. The regional Council for East and central African Football Associations (Cecafa) Senior Challenge Cup champions Uganda played an international friendly away to Botswana last Sunday, drawing the match 0-0. And Williamson believes his side can take confidence from that display. "We hope to build on our away performance which has been improving over time," he said. Williamson added that getting a good result in Zambia will be very important - with the home return leg to come in October. After knocking out Congo Brazzaville in the first round, Uganda are positive about their chances of beating the African champions and making it to the Nations Cup for the first time since 1978. Uganda FA President Lawrence Mulindwa hopes the Cranes can follow in the success of Stephen Kiprotich, who won the London 2012 Olympic men's marathon, to provide a further boost for the country. "We are not taking this match lightly and we expect many fans to travel to Zambia to support the team," he told BBC Sport. "This is a very important match and perhaps after a Ugandan winning gold at the recent London Olympics, the Cranes can also qualify for the Nations Cup." On the Cranes squad is U-20 internationals Joseph Mpande and Nicholas Wadada, who also travelled to Botswana last week. The other locally-based players invited include Steven Bengo, Denis Guma, Simeon Masaba, Robert Ssentongo, Hamza Muwonge and Edward Ssali. 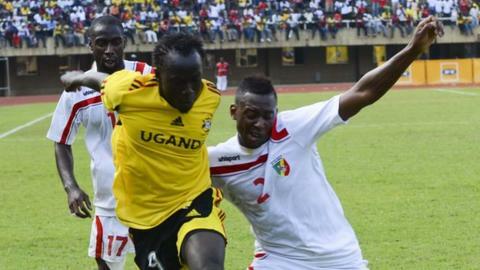 Strikers: Robert Ssentongo, Hamis Kiiza and Emmanuel Okwi.